Accessory and hose storage keeps vacuum attachments within easy reach. Wet dry vacuums are a useful tool that can make cleaning your garage easier. They can also be absolutely essential on a construction site. Having the right size with the right features will guarantee that you are happy with your purchase. Consider your needs before buying. Some models have wheels and are, therefore, more mobile and easier to use in a large area. Whereas other models come with a wider hose and are a better able to clean up large debris. Once you’ve analyzed your purpose for the vacuum, you’ll be better able to narrow down your choices. 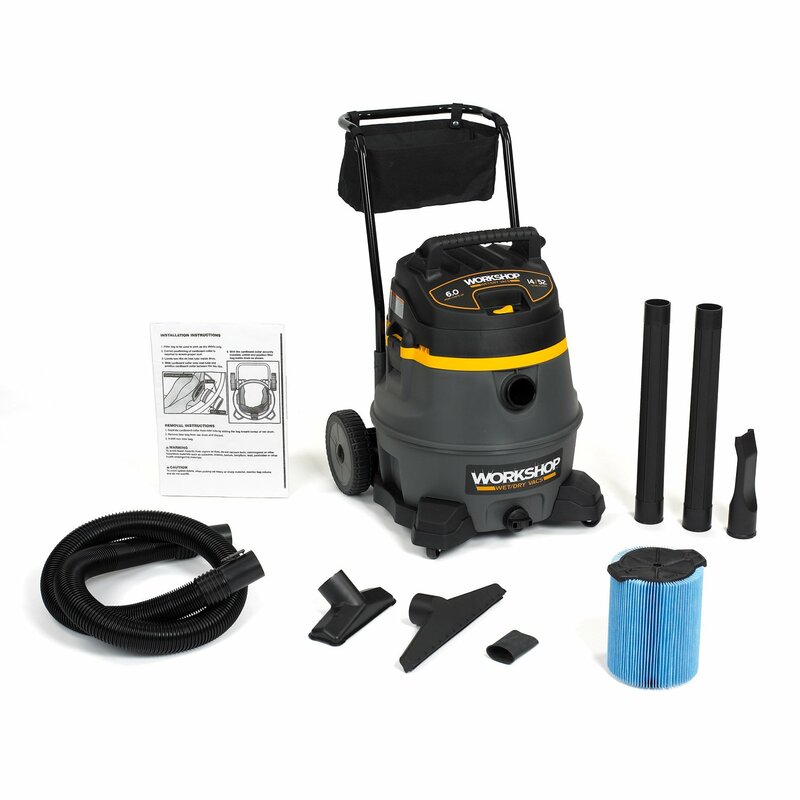 The Workshop WS1400CA High-Power Wet Dry Vacuum (WS1400) is a 14-gallon vacuum that has all the necessities and perks you’ll need. Dimensions are 32.5 inches x 20.75 inches x 22 inches. With 6.0 peak horsepower, you have the power you need to handle most messes with ease. Despite this power, this vacuum is fairly quiet for a wet/dry vac. Wet/dry vacs have to be designed with durability in mind because they are most frequently used in garages, shops, and the outdoors where they are likely to not only get dirty but also get bumped, scraped, and scratched. The WS 1400 is made of a tough copolymer that resists dents and scratches during heavy use. This copolymer also protects the vacuum from developing any rust from wet cleaning. Because you never know where around your home you are going to need to use a wet/dry vac, mobility is an important issue to consider. This is especially important when considering a large sized vac, like the WS1400. Large vacuums can be heavy and difficult to maneuver. The WS1400 has four wheels two of which are large, rugged wheels to help it get over rocks, sticks, and up and down stairs. The large wheels work in conjunction with an ergonomically designed handle. The handle of the WS1400 spans the width of the vacuum. It is also raised high enough above the vac to make it easy to fit your hand and fingers around it. It is angled to allow you to easily pull the vacuum wherever you need to go. Hose size, connection, and flexibility will greatly affect your ability to clean up debris. The WS1400 has a 2 ½ inch hose width. This is a good width because it is wide enough that large debris like wood chips and hardware won’t clog the hose. When you aren’t spending your time cleaning out clogs, you will be able to get jobs done faster and more efficiently. With a 7 foot length, the hose is long enough to allow you to clean a good sized area before you need to move the canister. Longer hoses are also convenient for getting hard to reach areas. This will allow you to reach on top of cupboards, around corners, under vehicles, and upstairs if needed. The hose also features dual-flex locking with 180 degrees of mobility at both ends. This feature helps you keep the hose from becoming twisted or kinked. Twists and kinks are other sources of clogs. The hose can be stored on the vacuum when not in use. Hoses that come fall off during use can slow down your progress and make a mess. Hose tabs will keep the hose connected to the WS1400. This assures that if you are tugging on the hose it is not going to come loose from the vacuum. Wet/dry vacs require occasional filter changes. The WS1400 uses a Qwik Lock Filter Fastening System that allows you to make quick filter changes. You don’t need any extra tools or parts to change the filter. In the WS1400, the filter slips over a filter cage that adds support to the filter. A locking stud then pokes out a hole at the top of the filter and holds it in place while on the cage. This makes for easy removal and cleaning of the filter. Keeping your filter clean is important because it keeps good suction and increases the longevity of the vacuum. When you have a dirty filter, the vacuum has to work harder to pull the air through. With the Qwik Lock System, you are less likely to put off changing the filter because it’s so easy. A Roll Tight Locking Sleeve holds the accessory bag in place during use. Storing these items on the vacuum makes for easy access. While working on a job you may find you need a crevice tool, for example. With the WS1400, it’s as simple as pulling it out of the accessory storage bag. You don’t have to keep track of an accessory bag in your garage or have accessories floating around loose in drawers or on shelves. They will be where you need them when you need them. The WS1400 comes with several accessories to help you clean. They include utility nozzle, car nozzle, wet nozzle, and 2 wand extensions. When cleaning wet messes, the wet nozzle has a squeegee on it to allow you to easily pull the water into the vacuum. There is also a plug located at the bottom of the vacuum that allows you to drain the vacuum after wet jobs. This plug makes draining and cleaning the tanks substantially easier. This vacuum can also work as a blower. You can blow sawdust, dirt, and other fine particles out of your shop or garage, giving the use of two tools in one. A 14-gallon vacuum, like this one, is large. While that means you don’t need to empty it very often, it also means that it will take up a lot of storage space. If you have a limited storage area, you may need something different. A 5-year limited warranty gives you some protection on the vacuum. However, it would be wise to read the warranty so that you know what it covers. For example, normal wear and tear or improperly using the vacuum will exclude any protection provided by the warranty. Some assembly is required. Some users have found the assembly difficult but instructions are provided with purchase. The Vacmaster 12 Gallon 5 Peak HP Wet/Dry Vacuum with Detachable Blower (Vacmaster) is smaller with a little less horsepower that the WS1400, but it can still handle all your wet/dry cleaning needs. The dimensions are 17.8 inches x 17.8 inches x 24.2 inches and it weighs in at 24 pounds. Twelve gallons is less than the WS1400, yet it still provides enough room that you won’t be emptying the vacuum every time it is used. Polypropylene makes up the hard outer casing. The Vacmaster is constructed for long term durability on these terrains. Heavy duty casters are used to aid in mobility. These will help when using the vacuum in a shop where you may be running over wood pieces, bolts, and screws. Outside you could end up pulling it across rocks, sticks, and other outdoor hazards. The wheels have to be able to handle this without falling apart or getting stuck. 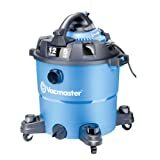 The Vacmaster can also be used a blower, which isn’t that unusual for a wet/dry vac, but what is unusual is that the blower can be removed and used as a separate mobile unit. A blower adapter attachment is included to give better control over the blower. Users report that the blower works well and is convenient to use. The blower moves air at 210 mph. It is easy to remove and replace with a quick release design, wherein with the push of a button, you can release and then reattach. Once released, you can blow debris off your work area or out of your garage without having to move around the larger tank unit. This gives you a second tool for the price of one. There is a handle for ease of portability. This same handle works for the portable blower unit. It is smaller than the handle on the WS1400, but still works well when you need to move the vacuum. Draining after wet jobs can be messy. Some wet/dry vacs make it nearly impossible to drain the tank without sloshing dirty water on yourself and the ground. 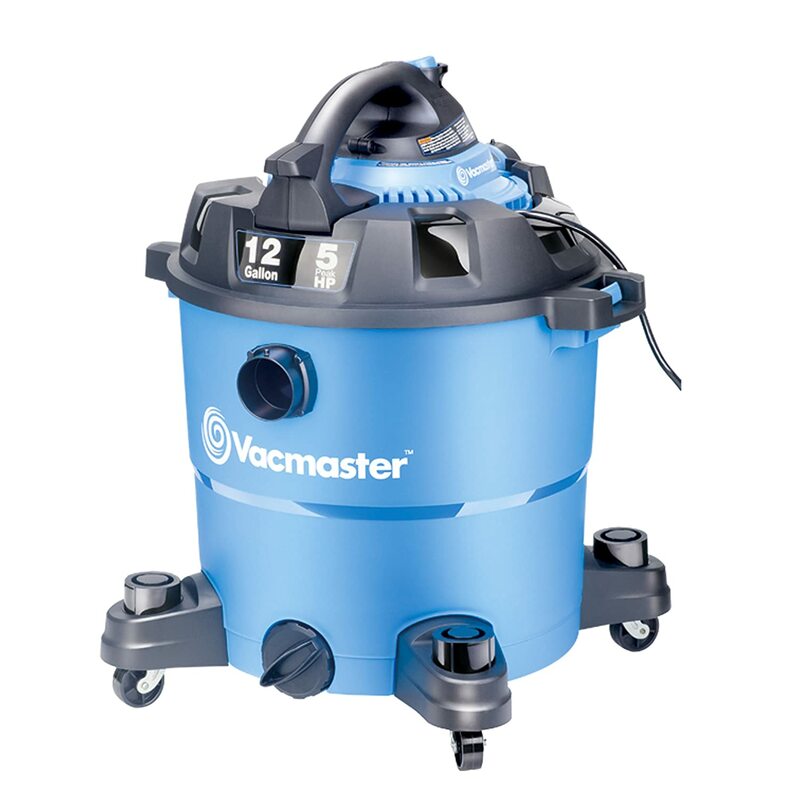 The Vacmaster has an extra-large drain port on the bottom of the tank for easy cleaning. When cleaning with a wet/dry vac you are often trying to clean a large space. The Vacmaster has a 12-foot cord that gives a good cleaning radius. You won’t have to change outlets often with a cord this long. When it is not in use, it compactly wraps around the canister for easy storage. Another feature to help you get a good reach is the seven-foot long hose. Between the cord and hose, you can reach a little less than 19 feet. The hose is 2 ½ inches in diameter. This will help you avoid clogs from large debris like sticks and hardware. Once those items get caught in a hose, additional debris gets backed up and you end up having to clean out the hose. A wet/dry vacuum is a versatile tool, especially the Vacmaster with the blower attachment. To give the vacuum even more versatility it comes with eight accessories to help with specialized jobs. Attachments include two extension wands, car nozzle, crevice tool, eight-inch utility nozzle, air/noise diffuser, and adapter for the blower wand. Extension wands will allow you to reach even further than the cord and hose. You’ll be able to get underneath stationary equipment and on top of cupboards and other storage devices. The specialty nozzles, like the crevice tool, give you the option of detailing your own vehicle. The powerful motor of the Vacmaster, along with this tool will pull out crumbs, dirt, and other debris. The diffuser gives you a good way to reduce noise. Many wet/dry vacs are so loud that you may need ear protection when using them. With the diffuser, you can protect your ears and not disturb others in your area. When you have an option that lets you reduce noise, you can use the vacuum almost any time of day. To keep track of the accessories, there is onboard storage located on the castor and on the top of the vacuum. You won’t have to dig through your garage or remember where you put nozzles because you will always have them with you. Assembly is required. Users found it very quick and easy to assemble and started using it immediately. It comes with a 2-year warranty. The Dewalt SCV581H 18/20-Volt Max Cordless/Corded Wet/Dry Vacuum (Dewalt) has a unique corded or battery operated feature that sets it apart from other wet/dry vacuums. The dimensions are 13.13 inches x 17.25 inches x 12.31 inches. It has a 2-gallon tank and it weighs 11.1 pounds, which makes it smaller than both the WS1400 and the Vacmaster. This vacuum boasts the ability to be used with either an electrical cord or an 18 or 20-volt battery. Battery power gives this vacuum extra versatility. It can be taken with you camping or to the beach for an easy way to clean out your vehicle. The battery gives you roughly 25 minutes of suction power. The unit can be purchased with or without the battery and with or without the battery charger. The price varies according to which package you choose. Portability is really where the Dewalt stands out. Along with the battery, the hose makes for easy transport by fully wrapping around the vacuum for easy storage and mobility. It comes with a crevice tool and a wide nozzle tool. Both accessories can be stored on the vacuum for easy transport. They also fit very snuggly on the hose so they won’t fall off while in use. The wet/dry filter traps used in the Dewalt are HEPA rated. HEPA stands for “high-efficiency particulate air”. These filters work by trapping smaller particles than a normal filter would let through. Other vacuums would recycle these particles back into the air. The Dewalt uses a true HEPA filter, not a HEPA-like filter. These filters must trap at least 99.97% of air particles of .3 microns to be called officially HEPA rated. If you are looking for a wet/dry vac that can handle fine dust, the Dewalt would be a good choice. The filter will get rid of those tiny particles that can get in your face, eyes, and lungs. They also work well in homes with a pet because they can cut down on the pet dander that causes allergies. This vacuum also has easy to access filters that make them simple to clean. The filter is washable and reusable. It can be rinsed in tap water, dried, and put back into the vacuum. This is going to save you money throughout the life of the vacuum. A five foot, crush resistant hose provides you with an adequate reach for most jobs. A crush-resistant hose is an important feature for a vacuum that may be stored in a garage. Not only will the hose not be crushed by the force of suction but it also won’t be crushed by other objects being placed on top of it. The hose is 1 ¼ inch diameter, which will work well for small debris. However, you may have trouble if you need to vacuum to get large debris such as nails and other hardware or large pieces of wood. The hose diameter of the Dewalt may cause these kinds of materials to get clogged. 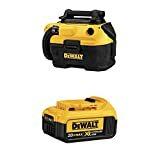 While the Dewalt is a wet/dry vacuum, its size makes it more useful for small jobs in a garage or for cleaning wet spills around the house and yard. 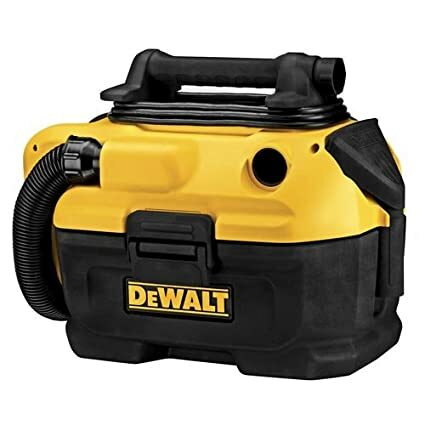 If you are looking for a powerful, portable wet/dry vac, the Dewalt is a good choice. 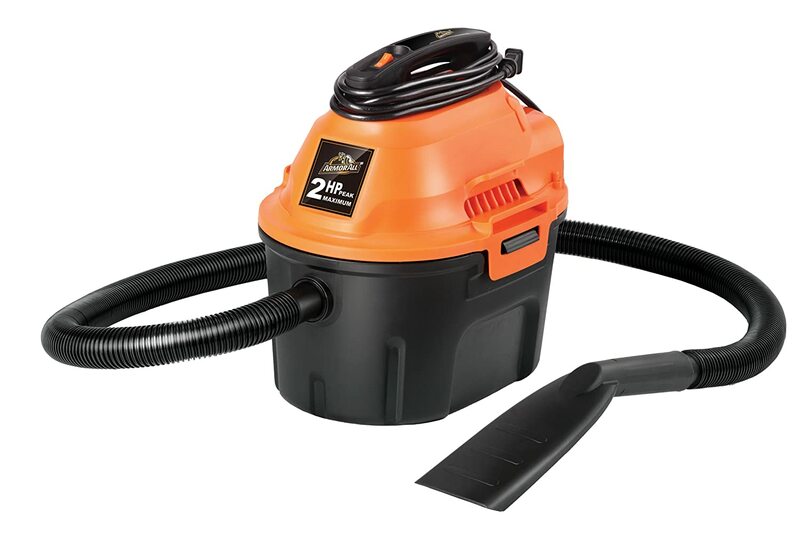 The Armor All 2.5 Gallon 2 Peak HP Utility Wet/Dry Vacuum (Armor All) is a small wet/dry vac that can handle cleaning vehicles and other small jobs with efficiency. The dimensions are 10.6 inches x 14.2 inches x 14.4 inches. It weighs only 9.1 pounds with a 2.5-gallon tank. The Armor All provides you with a small portable wet/dry vac. A top handle makes it easy to carry, while onboard accessory storage keeps all provided accessories in an easy to access bag. If you are looking for a small wet/dry vac that you can quickly take care of small messes, the Armor All is a good choice. It has a 2 horsepower motor that is adequate for its size. It can be converted to a blower that is powerful enough to dry your vehicle or wheels after washing. The small 2.5-gallon tank makes it easy to transport and use this vacuum around your house or in your vehicle. It is easy to empty and has an automatic shut-off function. Once the tank reaches capacity, it shuts off automatically to prevent overfill. This is particularly useful with wet spills that can leak if they get too full. Wet/dry vacs are notorious for their loudness. The Armor All uses a built-in air and noise diffuser. Since this vacuum will most likely be used to clean a vehicle, the noise reduction can save your ears when you are in a confined space. This also allows you to use it without worrying too much about disturbing neighbors. It has a six foot, 1 ¼ inch hose to handle your cleaning needs. The small hose diameter works well for small debris. This vacuum is not intended for heavy duty use or large debris like hardware or large pieces of wood. A ten-foot cord can help increase the reach of the vacuum. It also allows you move the vacuum freely throughout your car without having to walk around the outside of it. Accessories that are included are a reusable cloth filter, reusable foam sleeve, 2-in-1 utility nozzle, crevice tool, deluxe car nozzle, blower nozzle, and a detail brush. With the accessories provided, the Armor All can easily detail your car. You’ll be able to reach into all the crevices, clean the vents, and reach under seats. Before you purchase a wet/dry vacuum, consider how you intend to use it. The purpose of the vacuum will greatly determine how big of a vacuum and the kind of mobility you are going to need. If you have a large garage or shop that you do a lot of woodworking, welding, or mechanical work you will need a vacuum with a hose with at least a 2.5-inch diameter as well as a larger tank. 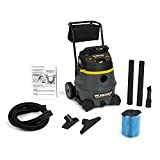 If you are mostly looking for a wet/dry vac for small jobs around the house and to clean your vehicle, a small portable vacuum will be what you need. Look for one that is easy to empty and clean because with a smaller size you will need clean it more often. Some wet/dry vacs come with castors or large wheels on the canister. These are usually found on the larger models that would be difficult to carry. They work well in large shops or garages and allow you to move freely while vacuuming. Heavy duty wheels and castors also work well if you are going to be moving the vacuum up and down stairs or on gravel and rocks. If you are looking for a small vacuum, look for one with a handle and good canister design. The canister should be large enough to handle a small mess, but small enough to make it light to carry. Twisted, kinked, and crushed hoses can make a wet/dry vac impossible to use. Hoses that are designed with a swivel feature at either end will be the easiest to keep untwisted and crush free. Check reviews for any vacuum you are considering because if there is a hose problem, it should show up there. Vacuums with some kind of hose locking feature will keep the hoses from coming off while in use. This is especially important with models with wheels because you will be dragging the vacuum along behind you. If there is no locking feature, look for a hose that attaches very snuggly. A long hose will allow you to reach difficult areas more easily. You’ll be able to reach across your garage without unplugging the vacuum or reach all the way through your vehicle with ease. Models with onboard hose storage will also make it easy to handle the hose when not in use. When considering tank size, examine the size of the messes you most often clean. Also, consider how much space you have for storage. Large wet/dry vacs can take up a lot of floor space in a small garage. At the same time, if you frequently clean large scale messes you don’t want to be stopping to clean out the tank too often. Wet/dry vacs have to be emptied and cleaned frequently for them to function properly. Look for models with easy to access filters and tanks. With large models, look for a drain port at the bottom of the tank for easy emptying. Keeping your filters clean will extend the life of the vacuum. Some models have filters that can be washed and reused, while others have filters that will need to be replaced periodically. The accessories provided with your wet/dry vacuum can make all the difference in its usability. Extension wands, utility nozzles, and crevice tools are the most common. If you are planning to use your vacuum for cleaning your car, look for a vacuum that already comes with car detailing tools. You can purchase these tools separately but it is easier if they are already included and fitted to the hose size of the vacuum. Models with onboard accessory storage will be the best for keeping track of all your equipment. They will be with the vacuum when you need them. There are many sizes and types of wet/dry vacs. Each has their strengths and weaknesses to consider. As you examine what your needs are, you will be able to narrow down your search until you have found the vacuum with the right features for you.